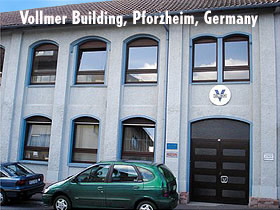 Ernst Vollmer GmbH has been in business in Pforzheim, Germany, since 1922. Originally the company was a watch case and bracelet manufacturer established by Ernst Vollmer. When third generation Hansjörg Vollmer became president of the company he was interested in producing watches in addition to cases, straps and bracelets. Hansjörg Vollmer, who studied business management in Stuttgart, had experience with a small watch distribution in the Baden-Württemberg's state capital. Thanks to his good French language skills and close contacts with major manufacturers in Switzerland Vollmer started making very traditional pilot's watches in 1998. He began using titanium cases, titanium onion crowns and Vollmer's own light and comfortable titanium bracelet. The offerings have grown a lot since then, Several dials used during WWII were revived using new stainless steel cases with big onion crowns are now available. Some are Limited Editions and a few are Chronometer models that have been tested and certified by COSC. 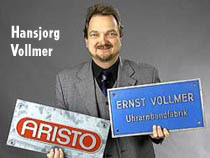 In October 2005, Hansjörg Vollmer joined forces with his Company Aristo Watch GmbH and the new company is concentrating their activities in a single Pforzheim company known as Aristo Vollmer GmbH. The Aristo brand has its own line of aviator, maritime and classic watches and a specialty brand named Messerschmitt that makes very affordable quarz movement aviator and pilot style watches. Aristo Vollmer GmbH also manufactures some items for other companies like metal bracelets. Specialties are meshbands out of steel, link bracelets out of titanium and a range of carbon products. Distribution in Germany an Europe is made by the company itself, in Asia and USA by distributors.